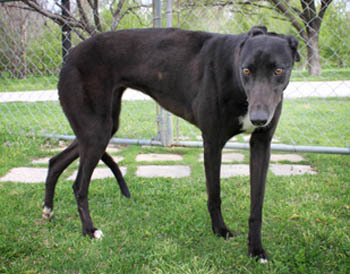 Tiffany, aka Rays Lexus, is an almost 3-year-old black female born August 29, 2009. Her sire is Flying Penske and her dam is Robin's Alexis. 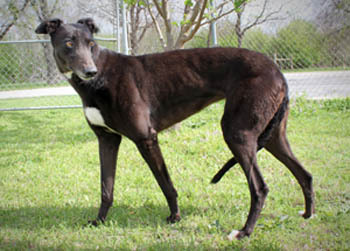 She has no races to her credit on greyhound-data.com, preferring to start her retirement early. Tiffany is littermate to Autumn. Tiffany's Cat Test: Tiffany sniffed both cats and promptly wandered away. She had no interest in them, even Floppy who was annoyed and was being very vocal. Tiffany is a sweet, quiet, reserved girl who would love to have a canine companion to hang out with in her forever home. She might also do okay as an only pet if someone is home with her most of the time. She loves playing with our dogs in the backyard. She totally ignores our cats - what a good girl! She's fine with our young boys - if they get to playing too loudly, she'll just get up and move. Small dogs seem to fit in the loud kids category - she avoids little yappers at meet & greets. She has learned her house manners nicely - she comes to find us when she needs to go out to do her business and has never counter surfed or gotten on the furniture. She crates well, and in fact sleeps much better in the crate than out on a dog bed at night. She rides well in the car - jumping in, laying down, and not rushing to jump out. While playful outside, she prefers just to hang out on a dog bed inside, preferably one with a window view. She has tossed a toy around ocassionally, but seems to prefer just picking one to keep near her for a few days and then swapping it for another toy. Tiffany She enjoys affection, snuggles, and hugs once she gets to know you. 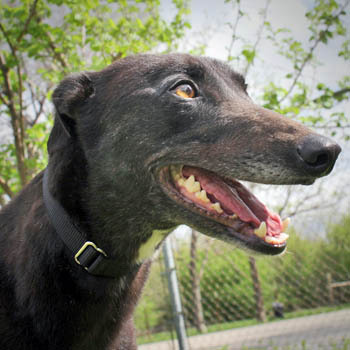 She can't wait to meet a loving, patient forever family who will give her time to blossom!